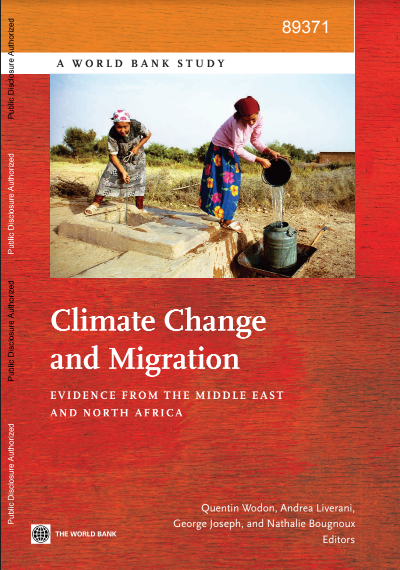 Climate change and migration are major concerns in the MENA region, yet the empirical evidence on the impact of climate change and extreme weather events on migration remains limited. Information is broadly lacking on how households in vulnerable areas perceive changes in the climate, how they are affected by extreme weather events, whether they benefit from community and government programs to help them cope with and adapt to a changing climate, and how these conditions influence the decision of household members to migrate, either temporarily or permanently. This introductory chapter summarizes briefly the main results of the study which relied on existing data as well as focus groups and new household surveys collected in 2011 in Algeria, Egypt, Morocco, Syria, and Yemen. The results suggest that households do perceive important changes in the climate, and that many households are being affected by extreme weather events resulting in losses in income, crops, and livestock. The coping and adaptation strategies used by households to deal with weather shocks are diverse, but also limited, with most households not able to recover from the negative impact of weather shocks. The ability of community level responses and government programs to support households is also very limited. Finally, while climate change is not today the main driver of migration flows, it does appear to contribute substantially to these flows, so that worsening climatic conditions are likely to exacerbate future migration flows.